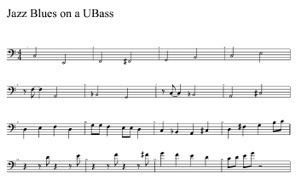 Transcription to Jammin’ with my UBass | 4 – Play UBass! Back in Sweden again. Have been visiting India the past 3 weeks! I got a request to do a transcription of one of my early Jammin’…videos. It’s a jazzy blues improv. The drums is played by Morgan Ågren from the Toontrack Jazz EZX. Since I only had my iPad with me on my travels I had to do the transcription on that. I used a app called iWriteMusic with is quite good once you get a bit used to it. It doesn’t have the ability to make TABs so this first post is standard notation only. TIPS! Check out latest post for updated and corrected PDF with TAB! I will also try to make the usual PDF with both standard notation and TAB. Normally I use the great notation software Sibelius. It has a great way of making TAB from standard notation. This is by far the best way to read music. Having standard notation and TAB is great. That way I can easily show you my suggested fingerings. Using only standard notation doesn’t do that. BUT it can also be a good thing since you will have to make up your own fingerings that might be better for you and makes you think more about HOW you play! So let’s see if you play it the same way I did or not. In this particular case you can of cause watch the video and figure out my fingerings anyway. But if it was audio only, it’s not that easy. If you find this to be a useful tool I can make my transcription available in this format too. That way you can play back the song at different speeds and even change key if you want to. Drop me a line to ubasslessons@gmail.com if it’s something you want!